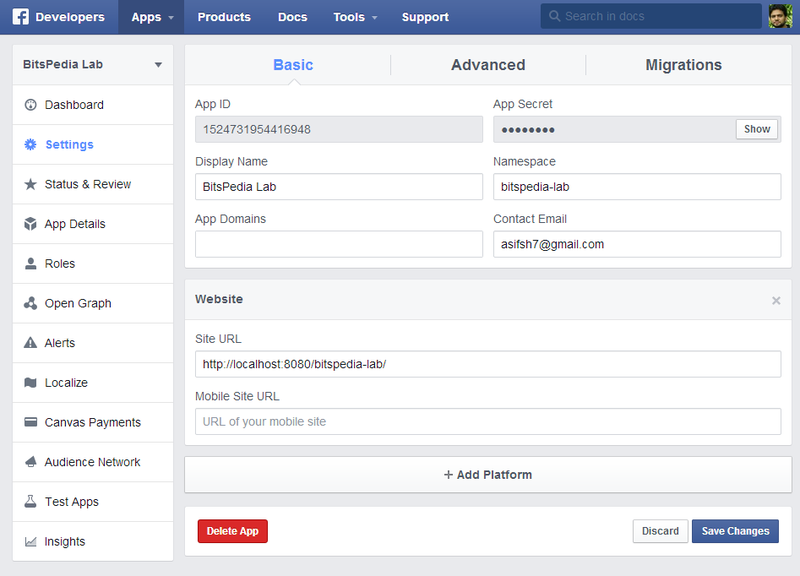 In the link that open Facebook Loging dialog, you need to specify one or more permissions that user must grant you, only then your applications can fetch associated data or performs a particular operation. If you do not specify any permission, default basic_info was used in API V1. In latest V2 API, the default is named to public_profile. If you are developing a new Facebook App or your Facebook App was not active for last couple of months, the Facebook by default would use API 2.0 version to serve your requests that no more allows fetching all Facebook friends list with basic_info permission. (Reference) basic_info permission no more exist, it has been replaced with public_profile permission (the default) which contains same info except the friends list. The all login user friends list were earlier available under basic_info. Go to https://developers.facebook.com/apps/ and choose Create a New App under Apps Tab. Note your App ID and App Secret, it would be used in our app code. Under left menu, choose Status & Review, and Activate App for general public clicking the right button labeled as NO, make it YES. so that anybody can use it to login at your website. See below image how it should look. 2. 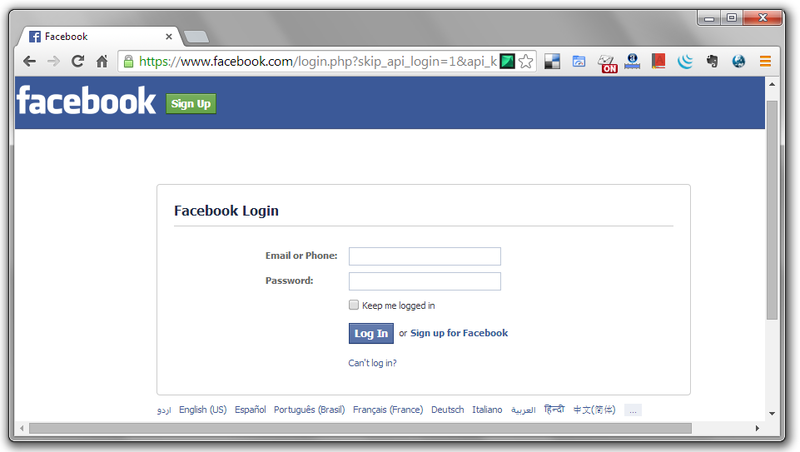 Create a login page with Facebook Login link. Its to open Facebook authentication dialog. Here is the link code in index.jsp, that contains this link. 3. When user click on the link, it open the Facebook Authentication dialog. 5. After user allows the asked permissions. The Facebook would redirect the user browser to the link you provided above opening Login Dialog under redirect_uri. When Facebook redirect to provided redirect_uri, it also sends a parameters (as HTTP request parameter) with the name of code. We would use the code parameter is used to retrieve access_token. We would do so in FriendsListServlet. 6. 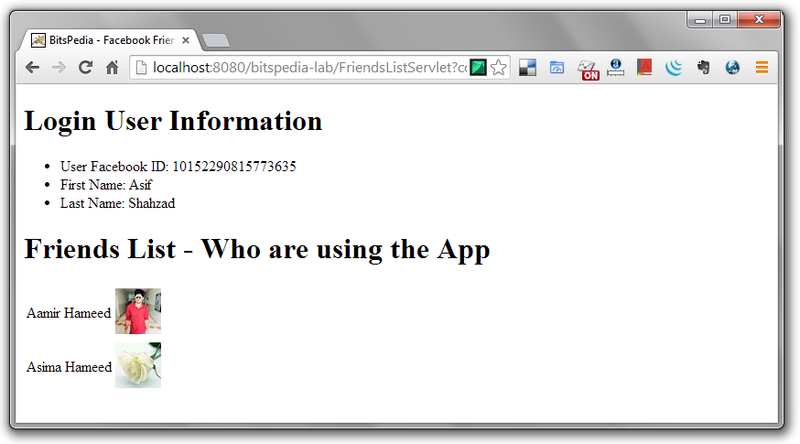 Below code belongs to FriendsListServlet. It seems lengthy, but performs very simple task. The brief explanation is given after the code section. code parameter is submitted to our servlet by Facebook. We have retrieved it from request in Line 28. It would be used later to fetch access_token. access_token is another alphanumeric long string that is used instantiate FacebookDefaultClient object (a RestFB Class). This client object would be actually use to make different API call to Facebook server. client secret (this is APP Secret), to make sure only authorized persons could make API calls on behalf of an App. You should not share it with others. code, this is same code that was submitted to the Servlet. The readURL method in Line 41 actually makes the request to fetch access_token, it just returns the string that contains access_tokens and epires attributes. The format of the string return by readURL is access_token=CAAVq7RqWb&expires=5158143, now we need extract the access_token value from it. Line 41-50 does so. Line 52 instantiate DefaultFacebookClient object that takes access_token and APP Secret in it constructor. The DefaultFacebookClient object is used to make different API calls. Then we have retrieve the login user info and his list of friends who are using our app and stored it into request arguments, from where the JSP page would retrieve and display the content as output. 7. The JSP page output is as follows. If you know even very little about JSP, you can see have just displayed some attributes of loginUser key we inserted into request as an attribute. 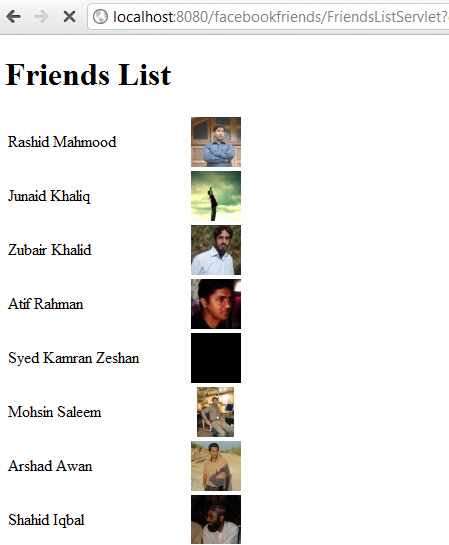 Then I have iterated the friends list to display the name and picture of each friend. You can Download Complete Source Code too. Share your issues under comments, i would reply to address in this or new posts. Complete source code is available:Click Here to view. Don't forget to replace the CLIENT_ID and APP_SECRET in above code snippets (and attached sample project) with actual values you got in Step 1. Do u have a complete example somwhere for this ? I don't find a complete example, I shared code snippets from my project I created about a year ago. I will attach complete code (in form of project) by this weeekend, with this article. Working sample project created and attached. please reply immediately as well as possible. Then you can get Birthday as String using: fbUser.getBirthday() (I tried -(tag-end) works perfect). If you need it as Date object, use fbUser.getBirthdayAsDate() -- it should work --- (restFB.jar 1.6.9). Please also note, you will get birthday of friends who have really shared with you. For others, it will return null. 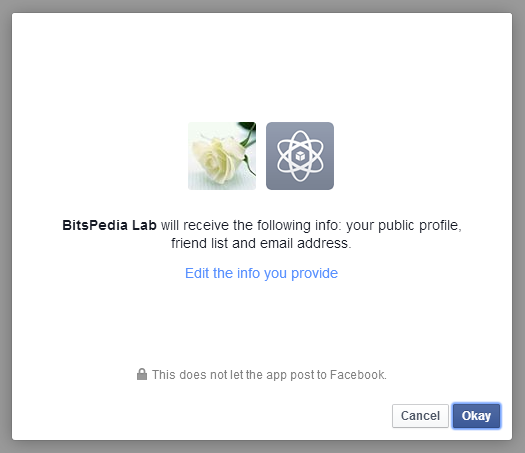 Here fbId is just user ID that you already have in the friends collection returned by RestFB. This approach is also good because, you don't need to waste your memory to save a lot of pics and it will serve an updated picture always. Hope I answer your question, let me know if I can help you more. Hmm, seems the action is missing or not mapped properly. You must create facebook-connect.action Or you can create a simple Servlet. Please see the attached files/project and tweak it as per your requirements. Please note, I am using Conventions Plugin of Struts 2, which magically maps the URL to action classes. It seems, you are not using that, in your lib folder. Please have a look how Conventions Plugin works, or simply put it into your lib to see magic. hi i use simple servlet and jsp. thanks for replying my questions. My next task is whatever i got list with pics save the datastore. So u have any idea regarding google app engine. again u have any solution please tell me. please reply. i need any kind of solution. Explanation from App Engine: This request caused a new process to be started for your application, and thus caused your application code to be loaded for the first time. This request may thus take longer and use more CPU than a typical request for your application. i am new and i am totally confused of that url which you passing and what is client id.
" An error occurred with Reliable Rishtay Development. Please try again later "
can any one help ? I download your project and changed the application id and secret id.I execute this source code but i could not get value for parameter code.pls tell me how to get value? how to get application id and secret id? Source code link updated to Google Drive file. Please choose File->Download to download compressed file. there are lot of files attached with it.....where to place these all files and how to run these files ?????? Save the Changes.. Wait for 5 min.. Run the Sample Code.. It will work..
Can u please guide me for getting User Details using your Sample Code? i have access token ,can i get friends list using that access token. 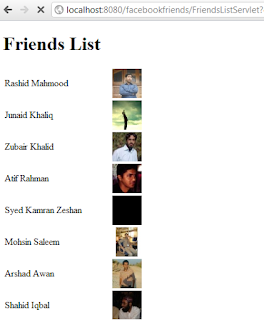 I am not getting correct count of friends list.. Can you tell me what is the problem? How can I download the facebook user profile photo using java? Read updated post above, I have discussed some issues and shared new code sample. But i don't receive anything but an empty friends list!